The last time I wrote about General Electric (NYSE: GE) stock it was trading comfortably above the $30 mark whilst offering up a forward dividend of 96 cents apiece. I concluded that article by saying it was probably in the fair value range based on management’s earnings estimates for this year and fiscal year 2018. Over the course of the former, earnings were due to come in at $1.50 per share, rising to $2 per share by the end of 2018. Given what has happened over the past twelve months I think we can safely say that conclusion hasn’t aged too well. Firstly let’s get the big headline news out of the way. Yesterday morning the company announced that it was slashing its dividend in half; only the third time it has done so since 1899 and the first time outside of a major economic recession. Not at all a good sign that things are running smoothly in the underlying business. More importantly it became clear just how inflated those previous earnings targets were. Based on 2016 earnings per share GE stock was trading at 25x earnings when that article was published. Let’s then throw in the guidance mentioned above for this year and 2018 which, on the basis of that $32 stock price, meant we were looking at forward price-to-earnings ratios of 21x and 16x respectively. Doesn’t really look cheap, but throw in a then 3% dividend yield and you might have been willing to view it as acceptable. Unfortunately that earnings guidance has now evaporated into the investing ether; the net result being a share price that is down 40% on where it was at the time that article was published. The most important question right now is figuring out what happens next. Where does the business, and indeed the stock, go from here? Yesterday’s investor presentation was basically an acknowledgment that GE has been a bit of a mess in recent years. The first point to get out of the way is that the $2 earnings per share figure isn’t going to be seen anytime soon. For fiscal year 2017 the company reaffirmed its ‘new’ earnings guidance of $1-$1.05, while forecasts for 2018 are not much different at $1-$1.07 per share. Secondly, if you want to rationalize today’s dividend announcement then look no further than the cash flow statement. Last year the company spent a total of $8.8 billion on cash dividends. To put that into context that’s around $2-$2.5 billion more than 2018 free cash flow guidance of $6-$7 billion. Factor in debt and pension obligations and yesterday’s announcement was a no brainer. That said for most investors 2018 is not the immediate concern, nor is the dividend for the matter. There’s no sense in paying a distribution that is unsustainable and the $4 billion or so per year that will be freed up as a result is clearly needed elsewhere. To that end the company is aiming for a leaner, more concentrated, and more cash generative portfolio with a plan to exit $20 billion worth of assets over the next couple of years. The board will also be trimmed by a third by the time shareholders meet for the 2018 AGM. The major plus point is that I think there’s a clear route to achieving this. GE is still a world beater in much of what it does. Its aviation and healthcare segments are solid, high tech, cash generative businesses, and together account for around 60% of operating income. There’s also long-term growth to be had in these segments assuming the company can get itself back on track. The downsides are numerous, but perhaps the biggest issue to tackle is stabilizing the Power unit. This segment basically consists of selling services and equipment to gas and coal fired power stations, an industry it dominates alongside Germany giant Siemens. The good news is that it is still a world beater here too (after all it’s pretty hard to muscle in on this kind of industry). The bad news is that demand seems to be dropping hard, in part due to the growing switch to renewable energy sources. New orders have plummeted, and revenue and operating profits have followed suit. The latter was down by a whopping 51% in the third quarter. 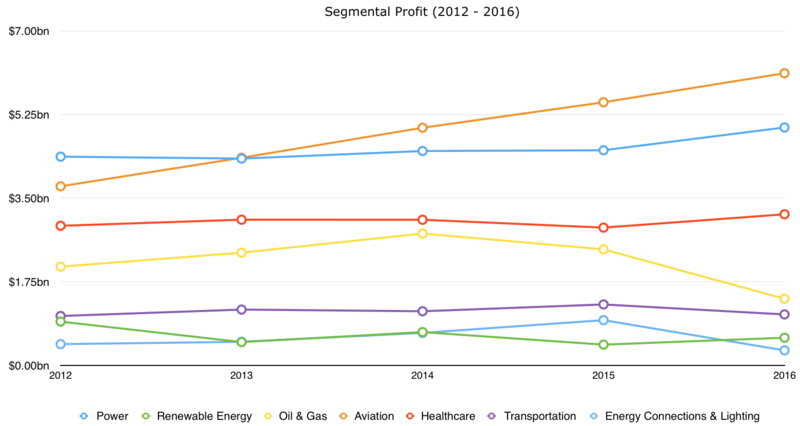 Management forecasts another 10% decline in revenue and 25% decline in operating profits next year, and though GE does have its Renewables Energy unit it is tiny in comparison and far less profitable in relative terms. Last year the segment generated $9 billion in revenue and just $0.58 million in operating income. That said there is one line of argument in the GE story that is best avoided: that all of the stock’s woes are down to the performance of the underlying business. Though it is a popular view point it is also misguided. 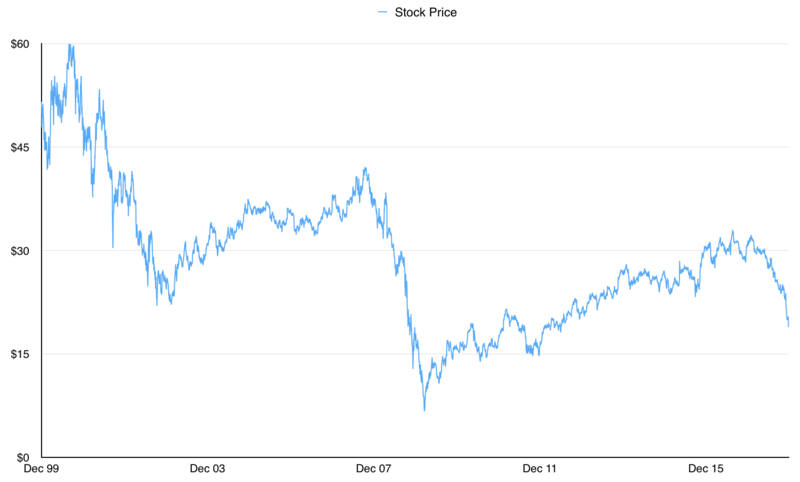 It is true that the current share price of $19 is over 60% lower than it was at the turn of the century. It is also true that every $10,000 invested in GE stock back in January 2000 is only worth around $7,000 now (assuming reinvested dividends). These are horrible stats. However it is also true that GE was trading at over 30x earnings at the start of that period, whilst its average annual valuation has only dropped below 14x earnings in three of the past seventeen years. Right now GE stock is trading at 18x ‘here and now’ earnings. Though this a is much more sensible starting point I’m not sure it’s enough, especially in the short term. To see why let’s re-examine our pathway to acceptable shareholder returns. The first part of that route is the earnings growth rate. Right now things are in such a flux that it’s hard to really say anything on that front. Heck GE was making more money per share back in 2000 than it will do in 2018. Management thinks organic growth will come in at between 2%-4% with a further 0.5% to be had from efficiencies. In other words it will probably track inflation from here on out. Now ideally this is where some kind of margin of safety kicks in, after all plenty of folks won’t be prepared to follow management guidance on that. On that front the first port of call is the cash dividend. Think Royal Dutch Shell yielding north of 8% in the depths of the 2014-2016 oil crash for example. Unfortunately GE’s new $0.48 annual distribution only represents a current yield of around 2.5%, so not much protection on offer there. Can we look to the value multiple to offer some upside? Probably not. Given GE is on the brink of a massive restructuring I’m not sure anyone will suggest the stock deserves to trade higher than 18x earnings right now. Add all that together and it doesn’t leave much to go on. I wouldn’t right it off. After all this is still a $170 billion company we’re talking about here, even after the stock price carnage of the last 12 months. It has also reinvented itself before, with attractive enough assets to do it again. But this also has the potential to be a major drag for some time to come. If you’re a current shareholder file it away in a dark corner of your portfolio. If not, then I think it’s time to start demanding a more realistic valuation multiple on current earnings before going further.